You are here: Home / Uncategorized / Down.Set.Hike! This is the part where the centre “snaps” the football between his legs to the quarterback to start the play. For the purposes of maintaining the analogy, NERSA is the Centre and ESKOM is the quarterback and we, the consumer are the football! If you haven’t heard, NERSA has granted Eskom a 12,67% annual tariff increase from next year – this is 4,7% more than the original 8% hike approved. 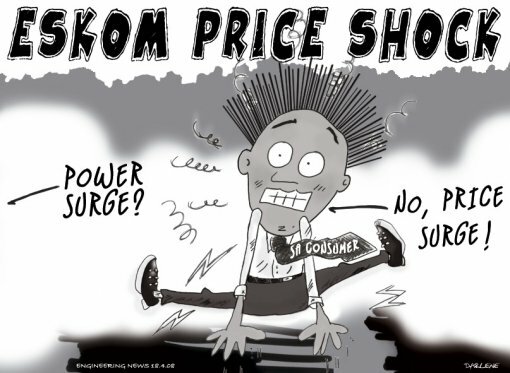 And ESKOM are still whinging about it! The increase gives ESKOM recovery of unbudgeted costs of R7,8 billion and they STILL want the right to recover around R18,4 billion in unbudgeted costs. So, once again and despite NERSAs’ original 8% approval, ESKOM has got it’s way once again and we , the consumers are going to foot the bill. By consumers, I don’t only mean the homeowners and tenants that pay monthly utility bills , but also business that use huge supply to run manufacturing , mining , retail , medical and the rest not mentioned here. We pay more so ESKOM can borrow more for less. There is something fundamentally wrong with this. The good news is that more and more consumers are taking action to be less and less dependent on ESKOM and opting for Solar Power or more efficient ways at using electricity , as well as taking measures to maximise efficiency when they do use electricity. So, my only consolation here is that this wanton Greed from our National Electricity Supplier, will drive many , many people to use less of their electricity and use more of the natural power resources our country is blessed with. By putting their prices up , they drive more people to invest in alternative sources of power. All I can say is – do something, even if it’s just a little something. Get a geyser timer, put on a geyser blanket, change your lamps to CFL or LED, look at Solar and keep an eye on technology because I can tell you without doubt – we will get less dependent on ESKOM.